In a sharply-worded editorial, a top Chinese media outfit, described by BBC as state-run, has said, commenting on India's foreign relations with its neighbours, that "speculation and suspicion" is "certainly not diplomacy". Published in "China Daily", the largest circulating English Monday-to-Saturday newspaper with branches across the world, the editorial notes (September 20) that "several recent events" in Nepal and Bhutan, are "gnawing worrywarts in New Delhi". The editorial -- which comes close on the heels of a sharp critique of India's foreign policy in a state-supported Russian media outfit, Sputnik International, calling India's anti-Pak diplomacy as having "gone awry" following Prime Minister Narendra Modi's "half-baked" push for anti-terror drill down "others' throat" -- says, the " worrywarts" include "Nepalese troops taking part in a joint military drill in China; China granting Nepal access to seven Chinese trading ports; in Bhutan, pro-India ruling party failing in the first round of polls in the general election." According to the editorial, "The first is worrying perhaps because it was held days after Kathmandu withdrew from a major joint military exercise in India. The second because such access may reduce Nepal's reliance on Indian ports. The third sounds a little too weird, with some in India speculating one of the two candidates in the second round may seek to forge ties with China." Pointing towards how things are especially changing in Bhutan, following Prime Minister Lyonchhen Jigmi Y Thinley's meeting with Chinese Premier Wen Jiabao in June 2012 at the sidelines of the Rio summit, the editorial states, "Some Indian observers are so nervous that they are warning about their country's two immediate neighbours distancing themselves from New Delhi and embracing Beijing." 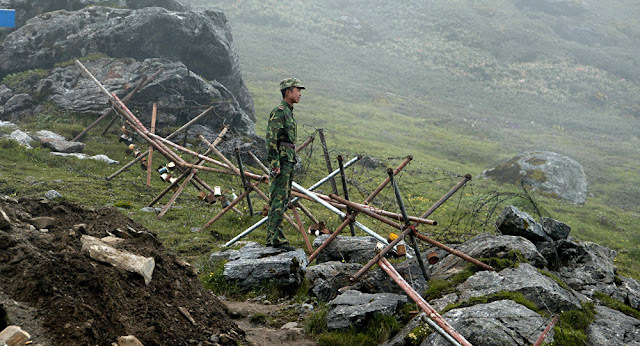 Insisting that these "observers" are worrying "too much", the editorial says, "The China-Nepal joint military drill is for anti-terrorism and disaster management purposes", adding, "Access to Chinese trading ports, while diversifying Nepal's trading route options, does not necessarily mean net loss for India. A more robust Nepalese economy will further boost trading links with India." As for Bhutan, the editorial says, "as a sovereign state" it knows "where it stands, and has balanced itself quite well -- between China and India", noting with appreciation that, while Nepal and Bhutan have been traditionally close to India, lately, they have "maneuvered a balance in relations with their other neighbour", something that is "consistent with Chinese foreign policy on neighboring countries." Underlining that this is the main reason why, "despite the absence of diplomatic ties, Bhutan and China have been on good terms", the editorial criticises "some people in New Delhi", who, it says, "may have difficulty accepting the two countries developing better relations with China." The editorial believes, "Aside from whether their country (India) is in a position to dictate other countries' diplomatic preferences, it is unfair to blame their own 'diplomatic failure' on Beijing, an uninvolved party." According to the editorial, "Rumours have linked Nepal's withdrawal from a joint drill with India to a two-month economic blockade by New Delhi in 2015, ostensibly because of Nepal's attempt to amend its Constitution." And, "the pro-India candidate lost in the Bhutan election possibly because India withdrew fuel subsidies, allegedly to punish Bhutan for that 2012 meeting." The editorial claims, "Beijing has never concealed its enthusiasm about its Belt and Road Initiative, and welcomes all countries to participate in and benefit from the connectivity project", wondering, "The question is: Do other countries need India's consent to take part in it?" In this context, it says, the editor of a Bhutanese newspaper has asked "Indian media and decision-makers to avoid excessive bigotry and suspicion", which it says, "sounds like good advice."